Take I-94 to Hwy. 53 North at Eau Claire. Take Hwy. 53 North to Trego. Take Hwy. 63 North to Hayward. From Hayward take Hwy. 63 North for 5 miles to Nelson Lake Road. 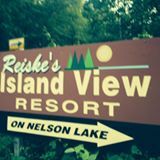 Turn left and follow 2 miles to Reiske Road and turn right.